September 16th, 2008 Worthington, Ohio. For more flower images, visit Today's Flowers. Wow- how bright and sunny for a dreary rainy day. No flowers - no bees. No bees - no flowers. composition, color, everything is absolutely perfect. My flower photo is posted here. Hope you can pass by if you have time. Thanks! Goldenrod is great if you don't have allergies. It's great for the critters for sure. your flower photo made me smile...the color, the bee and the texture were perfect. That bee is huge...which much mean the flower is actually much smaller and delicate. Love colors in this action shot. This really looks gorgeous in the large format! Brings back memories of summer! Wonderful Macro shot. Love the bee. Tom: This site really shows this off really nicely. I love the way you got so close! And I agree with Leora that the bee being so large made the blossoms that much more delicate. 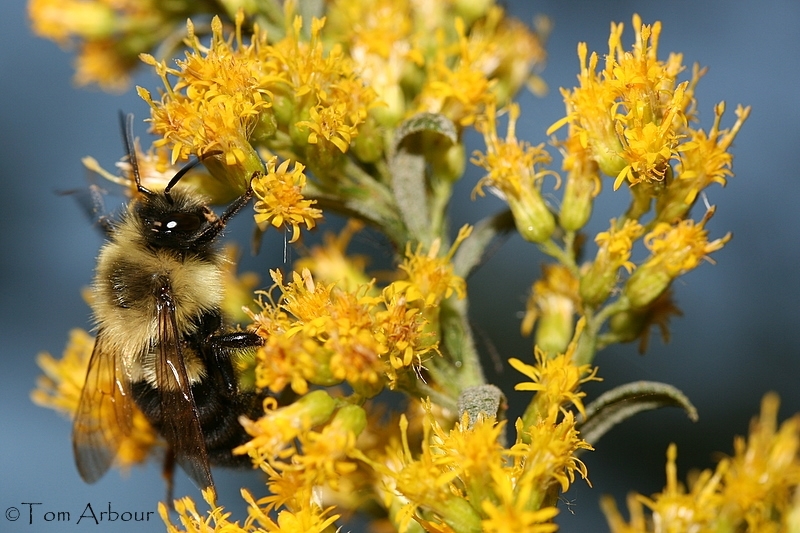 So often we see goldenrod as the composite flower and not the florets. Makes this winter cold a little easier to handle, thanks.